Harley-Davidson® hosted its 21st annual European Bike Week on the shores of Lake Faak in Carinthia, Austria from 4-9th September 2018. The free event – Europe’s largest motorcycle festival – welcomed more than 120,000 visitors and more than 70,000 motorcycles to the beautiful Alpine surroundings, while thousands of local people also lined the route of Saturday’s parade as beautiful sunny weather added to the festival atmosphere. This year’s European Bike Week took place during a major milestone year for Harley-Davidson, with the company celebrating its 115th year – and its Harley Owners Group (H.O.G.) also celebrating its 35-year anniversary. European Bike Week’s visitors were treated to an exclusive first public preview of the full range of 2019 motorcycles at the Expo Zone right beside the main stage; a unique opportunity to see them before anyone else in Europe. And the all-new FXDR® 114 Power Cruiser – announced just before the show – was present both at the Expo Zone and also available to test ride at the Demo Zone. The strength of the Harley-Davidson brand in Europe was highlighted by a record number of demo test rides recorded across the whole range of motorcycles. The core of the event every year is the immense Harley Village, covering more than 40,000 square metres and featuring official event merchandise and 21 Harley-Davidson dealers, along with more than 170 independent retailers and food vendors providing a diverse range of shopping, eating and drinking opportunities. The Harley Village’s main stage played host to bands for five nights; on Friday English glam rock legends The Darkness headlined, with Sweden’s Backyard Babies headlining Saturday. Saturday also saw a live draw for a brand-new Harley-Davidson Forty-EightTM Special, presented by Trevor Barton, International Consumer Events Manager at Harley-Davidson and Ana Mamana, winner of last year’s 20th Anniversary European Bike Week prize. Throughout the week attendees collected unique numbered wristbands to enter the draw, and in the end the Forty-Eight Special was won by an utterly astonished Valantis Pavlou from Cyprus – who celebrated with 30 Cyprus Chapter members who had made the journey in memory of a friend and fellow chapter member. And to mark 35 years of H.O.G. a special presentation featuring all of the H.O.G. annual patches and pins since the Group was founded was awarded to the winner, Thorsten Schneyer by H.O.G. International. Jeep®, a key partner and official sponsor of Harley-Davidson events and rallies in this 115th celebration year were demonstrating their latest all-new Wrangler (a true Jeep icon) Cherokee and renewed Renegade. As well as an on-site obstacle course at the Jeep Test Drive Area, there was also an Off-Road Experience where drivers could take advantage of all the four-wheel drive ability that the Jeep range offers. Other unique features of European Bike Week included the service area, managed by local Harley-Davidson dealer Motodrom and tours of the beautiful local countryside by the Alpe Adria Chapter, who were on hand to provide guided rides for the uninitiated. On Friday, the Custom Bike Show featured some of the most beautiful builds from Europe and ‘Best in Show’ was awarded to Radical Chopper/70s Helmets from Italy. 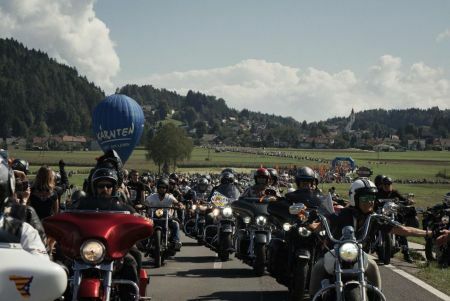 And, fittingly the sun shone for the annual Harley-Davidson Parade on Saturday which saw at least 10,000 bikes cross the starting line for a tour around the surrounding Carinthian mountains and lakes. The 22st European Bike Week will return to Faaker See between the 3rd - 8th September 2019.